Tiramisu layer cake – a dreamy dessert for all occasions. Melt in your mouth tender and light sponge cake layers are soaked with intense espresso and filled with fluffy eggless tiramisu cream. Yes, you read that right. Eggless tiramisu cream! It’s so creamy, and fluffy, and dreamy. It’s what cloud should be made of! This cake may look so complicated, but I assure you it’s not! You can make the sponge cakes a day or two ahead, then simply assemble it together the day you plan on serving. And if you’re not a pro at decorating cakes, like me, don’t fret. Who said the sides of the cake has to be perfectly smooth? Ok, here’re the step by step photos to make the sponge cake and tiramisu cream filling. And as you may have watched it, I demonstrated how to assemble this tiramisu layer cake in the short video up on top of this post. When soaking the layers with espresso, be generous! And if you want, you can also add shaved chocolate in between the layers. It’s a great addition, but it’s not necessary. Just a little something. Yeah, it sure is an effortlessly elegant and impressive dessert for all occasions. Hope you’ll get to make this beautiful tiramisu layer cake soon. And thank you for stopping by. Light and delicious Tiramisu Layer Cake! To make the sponge cakes, preheat the oven to 325°F (160°C). Lightly spray two 7-inch (18cm) round cake pans and line with parchment paper. Sift the cake flour with salt. In a mixing bowl with paddle attachment, beat egg yolks 2 tablespoons cold water until it’s doubled in size, about a minute. Add sugar, vanilla extract and almond extract. Continue to beat until the mixture is thick and pale yellow on medium high speed. Reduce the speed to low and slowly pour in hot water. In a separate bowl, whisk egg whites until foamy. Then add cream of tartar and continue to beat until hard peaks form. Gently fold in half of egg whites into the egg yolk mixture. Add the remaining egg whites and fold in until well combined. Divide the batter into the prepared cake pans. Bake for 30 minutes, or until the inserted toothpick comes out clean. Cool the cakes in the pan for 5 minutes. Carefully run a knife around the edges to release the cake from the pan. Then invert the cakes onto a cooling rack. Cool completely. To make the syrup, dissolve espresso powder in 1/3 cup of water, and stir in disaronno. To make the tiramisu cream, in a mixing bowl with whisk attachment, beat mascarpone cheese, sweetened condensed milk and vanilla extract until combined. In a separate bowl, whip the heavy cream until hard peaks form. Gently fold in half of whipped cream into mascarpone cheese mixture. Then add remaining whipped cream and mix until well combined. Refrigerate until ready to use. 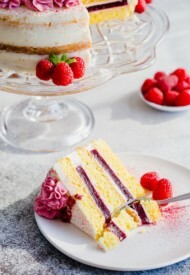 To assemble the cake, once the cake is completely cooled, cut each cake horizontally. Place the first layer on a serving platter lined with parchment paper. Generously brush on coffee syrup. Don’t be shy; soak the cake with the syrup pretty good. Then spread about 1 cup of tiramisu cream. Place the next layer and repeat until all the layers are stacked. Cover the cake with remaining cream. If desired, decorate the cake using a piping bag fitted with star tip. (I used Wilton 1M tip.) Dust with cocoa powder. Refrigerate until ready to serve. This recipe was originally published on June 17th, 2013. 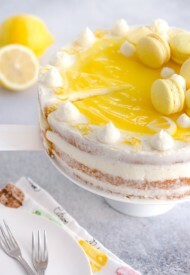 This is a yummy cake! I made it for Easter. I used 9 inch pans and used the 1.5 multiplier. Worked fine except I forgot to use it on the syrup and cream. I had enough cream (less the decorative touches), but I had to try to make up a bit more for the top layer. Overall, really good. I’ll try to remember to take a picture of it before it is all gone. Takes up a lot of room in the frig. Hi! I only have 6 inch pans, will that be ok to use for this recipe? Hi, Melissa. I’m not sure. If your 6-inch pans are at least 2-inch tall, you may get away with it. Even then, I’m not sure, because the batter fills my 2 7-inch pans pretty high. Hi, Anh. The hot water helps to achieve light and airy texture. Hope you’ll give this cake a try. Water helps to beat the egg yolks easier. Thank you again so much, Shinee. Is there any way this recipe can be converted to 8 or 9″ cake pans? Hi, Marilyn. I think you can increase the ingredients 1.5 times and use 9-inch cake pan. I haven’t tried this way though. If you give it a try, let me know how it turns out. Thank you for your reply. I did, however, buy 2 – 7″ cake pans – so I’m set to go! Yay, hope you’ll love it. Let us know how it turned out, Marilyn! I made this cake for a family birthday. While I had to increase the amounts needed because I had only 9″ pans, I used everything called for and followed directions exactly. It was wonderful!!!! Everyone loved it. It was moist, creamy, and had just the right amount of coffee/kahlua taste! I will definitely make it again. I could have used more frosting to pipe, but that might have been my multiplication and addition of fractions:-)) Thank you so much for the recipe! Hi, Ruth! Yay, so happy to hear you made the cake and your family loved it!! Thank you so much for your feedback! I would love to know how you converted this for 9″ pans. Most of us don’t have 6″ or 7″ pans (although I did just get 6″ and have a 7″ springform, I don’t bake enough to buy another size for layer cakes…). Hi, Hasna. Sorry to hear you had some trouble. Did you cool the cakes completely before assembling? It sounds like the cake layers may have been a bit warm since the frosting started melting. It’s important to cool the cake layers completely for this very reason. Hope this helps. Can I just soak the layers in coffee instead of making the coffee syrup? Definitely. I’d make a bit strong coffee though. Hope you’ll like it, Kaylee. Hello, the cake looks lovely and I am going to try it. Is the Tiramisu cream enough to do the decorations as shown or do I need to make more? If more, do i need 1.5 times? Thank you! Stunning cake! Would love to make this ahead. Can it be frozen? Hi, Will. I wouldn’t recommend freezing the entire cake, since the layers are soaked with liquid and whipped cream frosting may not turn out well after thawed. But you can bake the sponge cake layers and freeze them. Hope this helps. Let me know if you give it a try. Look at all those layers! What a gorgeous cake! I love tiramisu too! Stunning cake!! Tiramisu all dressed up for Valentines day. Love your addition of sweetened condensed milk into the frosting, fab idea.